Are we looking for YOU in the greater Baton Rouge, LA area? We’re looking for a Stork Lady partner in the greater Baton Rouge, LA area! Baton Rouge, Louisiana Stork Sign Rentals ~ Are you looking for extra income? We’re searching for a Stork Lady partner in the greater Baton Rouge, LA area! The Stork Lady brand has a growing presence across the south and much of the USA! We have several partners in Louisiana, but our partner in the greater Baton Rouge, LA graduated from LSU and moved out of state. She helped put herself through college with the Stork Lady opportunity and we continually get calls from her old customers, as well as others who are looking for a stork rental. We’d love to have a new partner to refer those calls to. And we look forward to offering our new partner unlimited support in helping them grow a successful stork rental business. 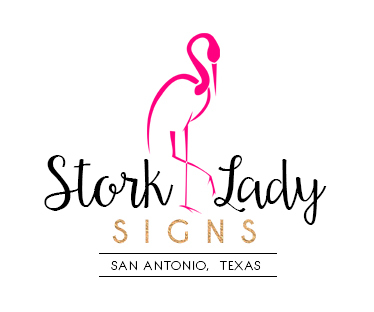 For a small financial investment and a few hours each week, you can build a stork sign rental business that can help you reach your financial goals. Stork Lady is not a franchise, so the profits are yours to keep. It’s easy to rent stork signs around your schedule, which is one of the many great things about this opportunity. Our partners come from all walks of life…stay at home moms, retirees, and families who work the business together. See our Business Opportunity page for more information. Visit our Gallery page to see all of the options for our beautiful yard signs. And please contact us at 210-601-7351 for more information.